My name is Terry Nelson and I live in Portland Oregon. My specialty is the restoration of mechanical timepieces. Though a humble man, I believe that you deserve to know who you are sending your watch to. Upon completion of coursework from Kansas City School of Watchmaking, I opened my watch repair business here in rainy Portland, Oregon, where I was later elected Secretary Treasurer of the State Watchmakers Guild. Though these are exciting fields, they pale in comparison to the finesse and mechanical prowess needed to become a competent watch maker. Not only am I driven to deliver world class mechanical repairs on the most complex and beautiful mechanical instruments ever devised, but I'm also driven to deliver impressive professional service. Timely and thorough communication is a necessity while in possession of a customers irreplaceable family heirloom. It's a joy to breath life back into a watch that hasn't run for many years. Allowing you to again hear the tick of your fathers watch, that you may not have heard since you were a kid, is the most rewarding aspect of my work. Often, ultimately more than just a watch is healed. My ethics, and reputation are as important to me as my eyes, touch, and material. Should I authorize you to send me your timepiece for restoration, I personally assure you of a safe, exacting and rewarding internet experience. I thought I'd share a couple meaningful photographs of some very special departed people. My mentor Ray Gustafson and his lovely wife Florence. As a kid in 1930's Chicago, Ray grew up in his family's jewelry store on Michigan avenue. Ray worked as a watchmaker before he sailed for the South Pacific in WWII. 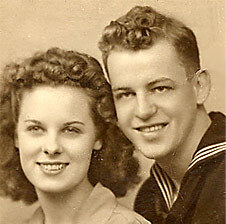 Upon his post war return home, the high school sweet-hearts married in two weeks. They waited that long, "just to make it look good." Like so many other adventurous Mid Westerners in post war American, the newlyweds grabbed their suitcases and motored west, visiting every scenic and cultural destination possible. Ray and Flo celebrated freedom, adventure and youth. When post war road-trip funds dried up in 1948 it took one day for Ray to find a good job. 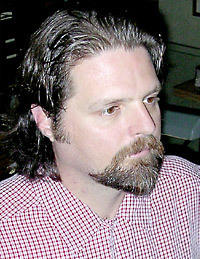 He was hired by Carl Greve jewelers as a watchmaker. It wasn't long until the calling of opening a family run jewelry store had it's say. 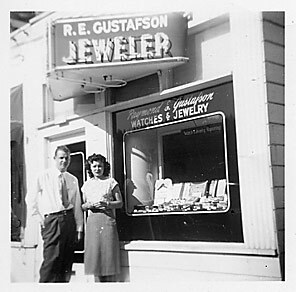 Ray and Flo opened their first jewelry store (pictured) in S.W. Portland across the street from the former Vaughn Street baseball stadium and then later in Portland's Hollywood district. Ray and Flo enjoyed pleasing customers, raising a family and living the the beautiful Northwest. Years later, in the fall of his life, and after I completed my watchmaker's coursework, I was lucky enough to befriend this third generation watchmaker - jeweler. He distilled for me wisdom gained from generations at the jewelers bench: Do great work and treat people well. His message stuck. The world misses Ray and Flo Gustafson.